I am starting a new chapter! A leap of faith! In the process, there have been times when I have felt like a fish out of water, and I am certain there will be more times when I am out of my comfort zone. 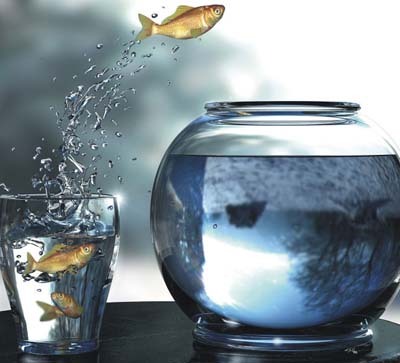 But I also know that finding that better “fish bowl” will be worth it in the long run. I have been pretty lucky in my fitness life with meeting the right people at the right time. Each one has been an important part in my progress… physically and mentally. When I first began my journey in bodybuilding and competing, I studied and researched and tried to figure things out on my own. There is so much information out there and a lot of it is contradictory. What works for one, may not necessarily work for another. Weeding through the nonsense to find the fundamentals was at times frustrating. This led me to seek out help. I found Dr. Joe Klemzweski, The Diet Doc. He taught me some basics about nutrition and the formula for success. It really is a science. Then there was Todd. He taught me about bodybuilding. Granted, there is still much for me to learn, but Todd taught me some of the basics in building muscle and the formula for success there. Now, I have a fabulous coach and mentor, Joe DiBianca. He is teaching me the formula for success in putting it all together and making the nutrition, bodybuilding/fitness, and the mental aspect of it all come to fruition… Not only in my life, but in the lives of many others. I am learning the importance of tweaking my mindset just a touch. It has been a slow process, as I am a creature of habit. Joe has been very patient with me. He has been my champion, and I am learning skills that will enable me to live the life I desire. Over the past few weeks I have come to realize that we see things not as they are, but as WE are. Our attitude and our thoughts shape and mold who we become. They also play a HUGE role in how our plans, goals, and aspirations play out. If we truly understood the power within us we would not be afraid to try new things. I am still working on this and I believe it is an ongoing process that takes a lot of practice and work, as with anything that is worth having. As I start this new chapter in my life, I feel I have aligned myself with positive and uplifting people and by surrounding myself with this combination and good energy, I WILL attain my goals! Lately I have been feeling a bit strangulated, like I am being held back in my life. Almost as if there is some kind of imaginary noose tied around my neck, preventing me from making the changes I want to make. I’m angry, and yet I remain in the same patterns I know are holding me back from my future. 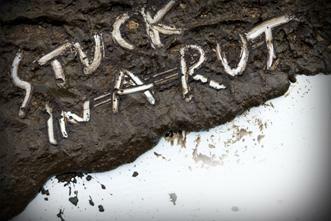 I am stuck in a rut! I realize I have created this rut myself, because I am too afraid to unhook myself from the chains, that in my imagination, are binding me there. I know it is silly and unnecessary, but I just keep hitting my head against a wall. At times I think I know what I need to do to get out of this place. It is just mustering up enough courage to do what I know I need to do. I feel sick. I feel helpless. Yet, I know I am NOT! I have the power to change this mess. Nothing changes if you change nothing, right? Life does not get better by chance, it gets better by change! And that is exactly what I am going to do! One of the hardest lessons in life is letting go. Whether it’s guilt, anger, love, loss, etc. Change is never easy, you fight to hold on, and you fight to let go.